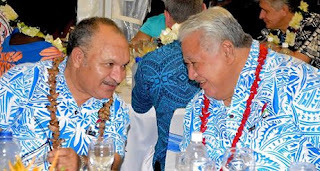 Papua New Guinea Prime Minister, Peter O’Neill has arrived in Apia, Samoa, for the 48th Pacific Islands’ Forum Meeting. “The Pacific Islands Forum is the premier organisation for the promotion of development and cultural engagement between Pacific Islands Nations,” the Prime Minister said. The theme of the 48th PIF is "Blue Pacific: Our Sea of Islands - Our Security Through Sustainable Development, Management and Conservation." “I endorse the theme of this meeting that highlights the importance of the water that surrounds our countries. "Healthy waterways are vital for the growth and development of our Nations. Our waters must be protected through sustainable management, and Pacific Island Nations must continue to take leadership on these issues." High on the agenda are discussions on the analysis of Regional Governance and Finance, Increased Economic Returns on Fisheries and Pacific Resilience Partnership and Climate Change. The Prime Minister was received by Samoa’s Prime MInister, Hon. Tuilaepa Lupesoliai Sailele Malielegaoi, MP. “It is a pleasure to be in Samoa to advance the PIF meeting agenda, with a very great friend of Papua New Guinea, Prime Minister Tuilaepa Lupesoliai Sailele Malielegaoi. PHOTO: Two of the longest serving Leaders of the Pacific Islands Forum share a lighter moment at the opening ceremony, PM O’Neill and host, Samoa’s Prime MInister, Hon. Tuilaepa Lupesoliai Sailele Malielegaoi, MP.